Jan Eliot began the strip in 1995. I'm not sure exactly when this particular strip ran originally, but it's clear between the strip and the Stone Soup header graphic that enough time has elapsed since this particular strip ran that Eliot has changed her drawing style a bit. There's nothing wrong with that, of course; any artist worth their salt should continue to evolve over time. But what I find interesting is that on the website, they're using her current art to promote her older art. "Hey, you can buy a print of this comic! But we're going to tell you that using art that's different enough that it doesn't look like the same artist!" 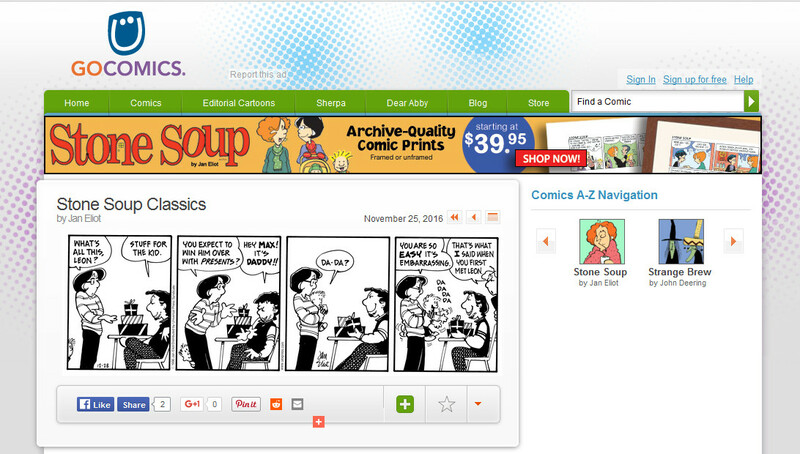 It's not just Stone Soup -- many of the "classics" strips they run do the same thing. Garfield, Dilbert, Foxtrot... The promotional art doesn't really match the strip. I do kind of get it. Most people are more familiar with the current art style, and are going too be more responsive to it, but at the same time, it seems a little misleading. I mean, I know it's the same artist and you're responding to them and their tone and style, even if the actual linework changes a bit, so it's not disingenuous in that sense but it still seems a bit like you're using a 2017 Dodge Charger to sell a 1987 version. Perhaps more interesting, GoComics doesn't do this with ALL of their "classics" comics. The Wizard of Id has different header graphics depending on whether you're reading the current strip or the old one. Same with B.C. I was thinking that maybe it was just for strips where a new artist stepped in, but The Norm and Big Nate also have unique headers for the old and new iterations. I suppose that means they're as conflicted on how to approach the topic as I am.